So now, thanks to ArnoCorps, I’m trying to take my New Year’s resolution of getting fit seriously. I’m up to over 230 Push-Ups so far, my BMI is doing pretty well, and along with a low-carb diet, I’m down quite a few pounds. But I still need some encouragement to keep me moving and grooving. In the past, I’ve had moderate success with the BodyMedia tracker (bought out recently by Jawbone), but I had to wear it on my upper arm. The tracking was solid, but the comfort level was not the best. I gave up tracking for a few years as a result—a shame since the tracker had some good software, iOS support, and the accuracy was quite good. It did include heart rate monitoring, sleep monitoring, in addition to steps and activity tracking. But the form factor is what ultimately did it in for me. 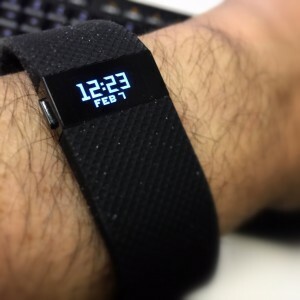 In shopping around, I looked at quite a few brands and devices to narrow the field: Jawbone, Nike, Fitbit, Garmin… and each one has its own set of devices with various features. I wrote off the Apple iWatch almost off the bat: Although it is reported it will track sleep and heart rate, I was not about to wait several months for its release (April? ), pay over $300 for an extension for my iPhone, and to have many more bells and whistles than I really needed. I wanted strictly a focused product. So that left the remainder of aforementioned brands. I got it down to two directions: The Jawbone Up24 and the Fitbit Charge hr. The Jawbone had a pretty good form factor—it’s just a bracelet without any displays. Its reported battery life was pretty great, and it tracked all the things I needed tracking. The list price of the Jawbone was around $130, so not terrible for all the included features, but I kept looking and eventually decided on the Fitbit Charge hr. The Fitbit Charge, which lists for $149, has something the Jawbone doesn’t: A display. The immediate feedback of such a display has really been working for me. I haven’t worn a wristwatch in ages (I’m more of a pocket watch kind of guy), but having the date and time on my wrist is a welcome feature on something that already looks like a watch. But I didn’t need a watch: I needed fitness tracking. 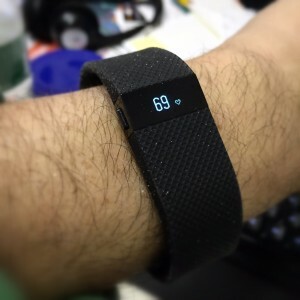 So let’s talk about some features of the Fitbit. I was pretty psyched to see the constant heart rate monitoring. It does so by using some flashing green lights on the back of the device which it shines against your skin. 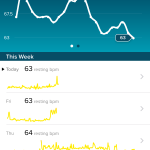 The accuracy is pretty good for not being in the doctor’s office, and I’ve been able to establish my resting heart rate over days and weeks to see how hard I need to push for a cardio workout versus a fat burn workout. As a step tracker, it’s pretty cool. It tracks both steps as well as elevations, so you get a sense of how many flights of stairs you’ve climbed. Fitbit wants you to walk about 10,000 steps daily. I’m afraid I haven’t hit that mark yet due to the cold and work, but knowing I’m behind is motivating me to get up and walk around during the day instead of staying at my computer. I haven’t really taken advantage of calorie counting since I’m primarily dieting through carb reduction, but I could do that if I wanted. Another advantage of having that display on the device is I can see these daily data points at the touch of a button. A number of the functions of the device can be adjusted through the iOS app on my phone. I can re-order what displays when through my app, change how the time is displayed, and if I don’t want to bother touching the side button, I can double-tap the device and have it display one of the data points. I have it set to the date and time, but I could easily have it set to display my steps on a double-tap if that’s my goal of the day. I’ve gotten the promised 5 days of use without having to charge again. 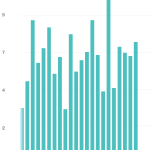 As a result, I’ve been able to wear the Fitbit pretty consistently. It’s “water resistant” not “waterproof,” so no showering with it, but shvitzing is okay. I miss the BodyMedia sleep tracking. BodyMedia was able to track and distinguish REM sleep. 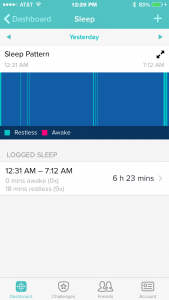 The Fitbit gives a very simplified display of “sleep” and “restlessness”. So I get an idea of how much I’m sleeping, but not a great picture of the quality of sleep. I’m hoping either Fitbit or another third-party app can interpolate the sleep data into something a bit more meaningful. A bonus feature of having a bluetooth connected device with a display: Caller ID. When I’m in my car, if the phone rings, my car display says, “Phone.” Yeah—I hear the ringing. I know it’s the phone. But who is it? Now, with a buzz on my wrist, I see who’s calling as a name appears in the display. The Fitbit can also act as a silent alarm, as it will wake you with a gentle vibration. The first time I did this I was surprised to wake up a lot less startled than with an audio alarm. It’s been almost a month with the Fitbit and I’m pretty pleased with the price point versus feature set. I look forward to Fitbit evolving their software and hopefully even connecting with Apple’s Healthkit (the Fitbit doesn’t play nicely with the Apple Health app, but there’s a workaround using SyncSolver—now priced at $1.99 in the app store). Now if I could only get the device to drive me to the gym, I’d be set! PreviousWheel of Pain Push-Ups by ArnoCorps will motivate you… or else.